Record Company – The National Trust (Enterprises) Ltd. 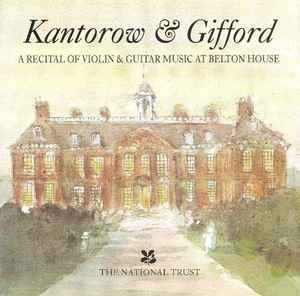 Title as front cover "A Recital Of Violin & Guitar Music At Belton House", on reverse of front booklet "Kantorow & Gifford Duo At Belton House", on disc label "Kantorow & Gifford Duo At Belton House" with "Works By Tartini, Paganini, Leclair & Guiliani" and on reverse "Kantorow & Gifford Duo At Belton House" with "Romance And Virtuosity". Recorded at Breton House on August 24th and 25th 1992.